AGED-UP NPCS - Hiccup and the gang are all grown up in SoD, just like the characters from HTTYD2! NEW LANDS - The School has been split up to feature two new areas: Training Grounds (Fireball Frenzy, Thunder Run Racing and Flight Club) and the Lookout (Farming and the Greenhouse)! NEW QUESTS - Three brand new quests have landed into the game so you can continued your adventures in SoD. UDT - The cap for UDT has been increased, plus now you can unlock items in store! New fix for getting Dragons through cheating....that's right. BYE HACKERS! Fixed several membership expiration flow issues. THE SKRILL --- One of the most anticipated and electrifying dragons lands in School of Dragons! The best part? The Skrill is available for members and non-members alike. New Quests -- Your high-flying adventures continue with two brand new quests: The Mischief of a Twin and Wanted: Berk Watch! Dragon Stables! – That’s right, you now have the ability to purchase, train, and customize multiple dragons! How many more you ask? There is no limit! Hiccup’s Flight Suit – Glide around School of Dragons just like Hiccup does in the new movie! Even better, Members get this flight suit for free! Gronckle Iron Quest – Participate with your favorite characters in remembering the time Fishlegs and Meatlug created Gronckle Iron, and even unlock a new game mode in Firebll Frenzy with Hiccup’s Crossbow! Did we mention multiple dragons? I think we did... MORE DRAGONS!!! Toothless for Members – Sign up for 3,6, or 12 month membership and receive Toothless in game! Ultimate Dragon Trainer Achievements – Earn more rewards and achievements for being the Ultimate Dragon Trainer! Check your journal for more information! New game in Heather’s Lab – We’re keeping this one a secret, go check it out! Power ups, Power ups, Power ups! – You’ll notice changes to some of your favorite games around the school! You can now use power ups in Fireball Frenzy, Flight Club, and Thunder Rrun Racing! Members now get twice the dragon energy! – A small gift for helping support us, your dragon will now be able to hold twice the energy it could hold before. Enjoy! Fixed issue with your dragon image not showing up and dragon XP not correctly displayed on your buddy’s profile page- We don’t want that to happen! Fixed bug where Advanced rod is given to the player by default - Sorry, guys! Fixed ability for players to shoot other players before countdown in Thunder Run Racing, again sorry guys! Ultimate Dragon Trainer! Do you have what it takes!? Berk’s Treasure Trove – new prize box on your farm! Bunnies are now available for a limited time at Johann’s Trading Post. New science standards section available in your field guide. Overhauled the ‘build mode’ camera system in farming, check it out! Lots and lots of bug fixes, including over 50 known crash fixes! Fixed fishing not awarding XP, sorry it took so long!!! Thunderdrum / Whispering death are now members only. We are giving away hookfang in Flight School for free. You can now play with Toothless in Fireball Frenzy. Terrible terrors added to Eel Roast, be sure to duck as they fly by! Did I mention we are now on Android? Shorter loading times, especially after updates! No more downloading 1000 files!!! Yak and Peppermint bush added to farming. Did you know we added ‘Did You Know’ facts in Eel Roast? New and improved job board, go talk to Johan! New user packages (packaged deals only available to new users). Mystery boxes in the treasure store (basically a random prize box). New Book of Dragons intro video. New First user experience (quicker load into the hatchery, tutorials after you have your dragon, no more boat, etc). DWA scientific method quest with videos from HTTYD 1. You can now increase your clan size/ type with gems, default clan size is now 10 (existing clans won’t be effected). We are adding more items that will effect the stats of players or their dragon. Special credits level, giving credit to all those who have devoted their lives to dragons over the past year. Go there and give them a shout out! Go Dragons! Phlegma and heather have joined the staff! Daily rewards! Rewarding the Vikings who play every day! New Hero Dragon levels! Fly as Stormfly! 3 New Race Tracks! The race is on! The Vikings have decorated for their annual Harvest Haunt. SPOoOooOOooOky! Limited time only! New Masks in the store! You can now dress up as Toothless! Limited time! Harvest Haunt farming decorations! The first official Harvest Haunt Contest! Win BIG! Johan is now visiting farms to buy various items from you! School buildings optimized for better performance! Fixed the issue of players ‘kicking’ farming and other items that spawn. Fixed fishing tutorial, so player will always catch a Perch, much less frustrating this way! Another attempted fix at not being able to reel in fish from Safari, we think we got it this time! Added Achievements into the journal- can you complete them all? Added Saddles to the store. The better the saddle the faster your speed! Fix to feed menu, it will now not close when you feed your dragon 1 fish. This should be much easier on all players. Woo! Added Player water quantity to ‘add water’ button. 5 New adult Flight Club levels, can you beat them? New Race Track Added- "Frozen Warriors". 2 New Laboratory Quests activities implemented. New chat system implemented (only going to get better from here). New first time user movement tutorial implemented. Dragon Shaders implemented (better looking, and better for memory and performance. Win / win). Invite a friend functionality (get 200 coins for every friend you get to register). Enabled invite and visit friends in your friends lists. Enabled visiting the farms of other players via profile page and friends list. Added a new tutorial that better explains how to mount your dragon at teenage stage. Added player tips to loading screens. Thanks Tumblr fans! Fixed dual dialogue boxes appearing in some missions. Fixed fish not being able to reel in bug. Addressed players switching profiles and getting dragons from other profiles. Addressed issue of avatar saving, getting corrupted, and players starting as default avatar. They will now be asked to re-customize their avatar. Addressed Dropped out of MMO issues. Addressed not being able to race MMO issues. Fixed issue with experiments not showing the correct temperature. Added messaging for not allowing numbers or symbols in viking or dragon names. Fixed some titles in various dialogue boxes that went missing. Membership now reflects in the game if purchased from the map screen. Optimized various particles in the school for better performance. Optimized various particles in Berk for better performance. Fixed overlapping text in the profile page. Fixed inconsistencies in the Wilderness mini-map. Fixed bug with meters tutorial when user first gets a dragon. Optimized various particles in the hatchery for better performance. Adjusted fishing percentages in the Wilderness to be more friendly. Optimized various particles in the Great Hall for better performance. Adjusted the size of teen Thunderdrum and Whispering Death. Adjusted firepits so they can be lit easier in all scenes. Fixed MMO avatar variables not resetting, this would cause avatars to get into bad states. Fixed issue of player 'bouncing' back and forth on the Nadder when mounted. Fixed issue in the lab of items scaling down when being added. Addressed the issue of players being turned back around when flying too far. Fly and be free players, fly and be free! Fix for bug where users were joining racing rooms after a race was started. Fixed a small memory leak in dragon customization. GUI alignment fixes in fishing and Flight Club. Added various sounds for various buttons throughout the game. Small improvements to boy and girl avatar face textures. Fixed bug where, offer speech for mission played again if you quit after accepting a mission and had completed it out of order. Removed 'checking for experiment box' when entering the lab. Less dialogue boxes! Fix for racing to make sure user positions were updated correctly after exiting a race. Fixed dragons firing into fire pits issue. Fixed fishing button being visible when opening journal. Fixes to fireball frenzy to smooth out user flow. Fixed being able to fish while standing on the top of your dragon. Added ability for dragons to stand on slopes of 45 degrees. Fixed being able to mount a dragon while it was carrying quest items for you. Fix for animations not looping after player plays with their dragons. Ammo range doubled for racing. Allow dragons to always fire regardless of happiness in Flight Club or racing. Auto target for fireballs will now target players nearest you. Fireball cooldown reduced for Flight Club. Fixed the dragon not idling correctly while fishing. Removed the annoying field guide updated dialogue boxes. Fixed player names displaying in the middle of their dragon when mounted. Various tutorial text updates for more clarity based on user feedback. Thanks! Added a 'gulp' animation when feeding your dragon. Ugly yellow particles are now gone! Updates to Nadder and Night Fury flying animations. Countdown added to Flight Club. Fixed bug where membership doesn't reflect in game immediately if player purchases membership from profile creation screen. Fixed bug of Flight Club of Toothless starting too early. Fixed players dragon being visible when taking a Taxi Dragon. Fixed bug where user name was not appearing in results screen for un-authorized users. Fixed issue of dragon flickering in customization. Fixed scrolling bug with quests. Fixed 'press' state for single player racing button. Fixed minor art overlapping issue in racing lobby with the dragons picture. Fixed bug of quest help tips not updating correctly. Fixed scrolling problems in profile page. Fixed scroll button functionality in 'favorites' menu on profile page. Fixed particles not playing when players level up. Adjusted flight boundary so you can get to Gothi's house. Fixed play and feed buttons disappearing when clicking their dragon before talking to hiccup. Fixed bug where race was not starting for MMO players if one player quits before the race loads. Raised the height of flower objects in berk for easier collection. Fixed for egg texture of the Thunderdrum. A new racetrack, Fortune Falls, has been added! Members now get 500 gems per month of membership. The game economy balance has been refined. 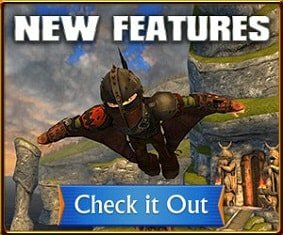 The correct image of Hiccup has been implemented when taking your first flight tutorial with Toothless. The lab’s crucible has been fixed to prevent materials from jumping out. Repeating sounds have been fixed. Brown Trout are now easier to catch. Fish no longer overlap with dialogue after being caught. New store buildings have opened in Berk and at the School. Fire and other particles in the world have been optimized for better performance. Avatar saving problems that turned avatars into the default Viking have been updated. High scores text and alignment have been fixed. Quests requiring players to collect and turn in items have been fixed. Players will not be dropped from School of Dragons when changing scenes or after playing games. Floating people, avatars stuck in the ground, and invisible dragons have been fixed. Issues with joining races at Thunder Run Racing have been resolved. Optimizations have been made to the Thunderdrum and Whispering Death dragons. Fixes to the chat system, including racing, have been made. Invisible players during races has been fixed. Dragon images appearing after taking the personality test have been fixed. Problems concerning vocabulary words that are unlocked in the field guide have been addressed. Freezes when receiving promo code messages have been fixed. Buttons no longer overlap on the About Me page. More information is available concerning what players unlock when their dragon reaches adulthood. Astrid got tired of hanging out by herself on the mountain. She’s moved to a more convenient location. Authorized players whose names were changed back to ‘Viking-###’ should be prompted for a name change when entering the game. Players no longer move behind the “Congratulations” pop-up after racing. Holes in the Wilderness, Berk, and School have been sealed. Various small quest bugs have been squashed. More sounds have been added throughout the worlds. Optimizations to reduce lag when players load in and out of rooms have been made. Black Deadly Nadder eyelids have been fixed. Hair no longer clips through Dagur helmet. Paths in the Wilderness have been made smoother and easier to navigate. Shadows have been made more realistic. Texture issues when aging up a new dragon. Avatar picture in profile picture are not updating after customizing avatar. Temporary texture issues seen on MMO players when loading into a new scene. Avatars still holding fishing poles after fishing. When in multiplayer races, tracks are not chosen randomly. Fixes to issues when selecting categories in the store, also made buttons easier to click. Dragon texture optimizations to improve overall appearance of dragons. A secondary fix for groups of dragons spawning in scenes. Fix for improving texture quality for players dragon. MMO optimization that should address the amount of network calls going back and forth between player and server. Added a fix for players running in place when not properly being disconnected from MMO. Fixed a bunch of chat issues, should be easier to chat now. Press ‘Enter’ to open chat at anytime. Various interface fixes to buttons, highlights etc. Optimized avatar saving for less lag and network communication. Various mission tweaks and fixes. A lot of players posted about having trouble buying bait, so we added link to the store button when players run out. Spread out player spawning locations in the school to help with lag and navigation. Fixed rocks ‘jumping’ out of the crucible in the lab. Optimized textures for avatars and dragons for better performance. Will be working on quality setting options coming soon. Fixed disconnecting from MMO when going idle. Optimized amount of people loading in MMO areas for better performance. Fixed various dragon animations issues. Adjusted Flight Club payouts for A+ grades rewarding correctly. Fixed bugs with the player map. Fixes to the Loom quest. New users should have no problems. Existing users, we are working so we can get this fixed for you. Improvements to the quest arrow while mounted on your dragon. Fixed various text overlaps and typos. Improved dragon spawning issues in various scenes. Fixed teen tutorial not appearing in Flight Club. Various art optimizations in wilderness, school, and fishing. Fixed Bucket playing Gobber VO. Lots of other small bug fixes.